Old Trapper found a new lease on life when we started using him to haul firewood in a little red plastic sled. He cheerfully hauls Julie’s load home for her. Photo by Miki Collins 1983. We called Trapper our Little Red Sled dog. Being a dark tawny brown with creamy markings, he could hardly be called red, and at 85 pounds, one would not call him little. This was about 30 years ago. 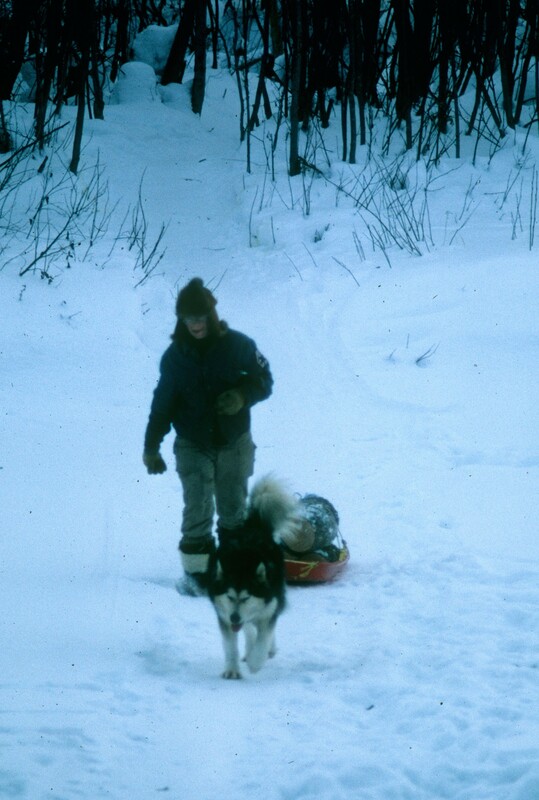 One of our first sled dogs, the old malamute could no longer keep up with the faster Alaskan huskies we’d acquired. Gradually, he had slipped into a life of leisure. Trapper had been a great wheel dog. When the sled slid off the trail into deep snow, he was one of the rare few who would cross the towline to the opposite side to torque it back on. But, like all good malamutes, pulling and power were his pride and joy, not speed. We retired the grand old dog to a plush life living inside and running loose in the yard. Sometimes we let him come along behind the team, but it wasn’t the same. People who think that having a dog pull in harness is inhumane should have met Trapper. They must think that once retired, he lived in perfect bliss, the best of all worlds. No confinement, no work. Trapper became subdued. He lost his booming “Yo-ho-ho-ho!” when the harnesses came out for the other dogs. He moped around inside, and sadly watched the team speeding away to haul wood or run the trapline or do other important jobs, leaving him behind. Then one day Julie brought him out to the woodlot. She piled firewood onto one of those little red plastic child’s sleds, put Trapper’s harness on him, and snapped it to the load. The old malamute leaned against the webbing, dragging the sled forward. His tail bounced up. He lowered his head and drove proudly ahead, striding off toward the cabin, hauling the heavy load behind him. He did so well that within a few days Julie could load his sled and send him home for me to unload. Trapper’s appetite came back. His bounce came back. Even though he only hauled a few loads a week, he was in harness again, being productive, pulling his weight. And he knew it. Once again, he could “Yo-ho-ho-ho-!” with pride. When he had a choice of running around loose or coming out to work, he chose work every time. He wasn’t little, and he wasn’t red, but Trapper was the best darn Little Red Sled dog we ever had. This entry was posted in sled dogs and tagged Julie Collins, malamute, Miki Collins, retired sled dog, sled dog. Bookmark the permalink.